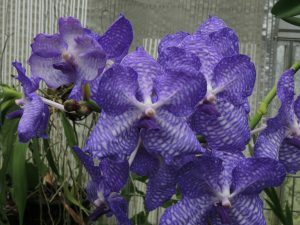 This wonderful species from North East India through to Thailand is one of the ones that stops visitors in their tracks with its large blue/purple flowers and intricate patterning. One of our plants featured at the recent Malvern Show and it wasn’t until we got it out of the greenhouse that we realised it has reached nearly three meters tall. Our largest plant at Malvern. Unfortunately the attractiveness of the species has caused it to become very rare in the wild and it is designated as CITES appendix 1 to help protect surviving populations. It is widely grown from seed although nurseries tend to focus on large round flowered clones (like ours) for propagation rather than embracing the natural diversity within the species. 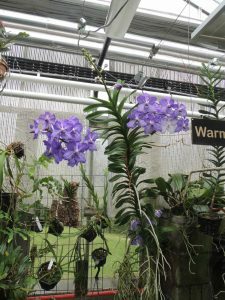 The plant is native to deciduous monsoon forest from 800 to 1700m which means it prefers cooler temperatures than most large growing lowland Vandas although selective breeding has tended to focus on plants that tolerate warmer conditions to suit commercial orchid production. We grow our plants in Warm Asia where they do very well and eventually produce side growths which will look amazing in another few years. This summer one plant has five spikes, three from the main stem and two from a side shoots. The plant enjoys dry roots between watering and our plant is ‘in’ a 4 inch basket! Actyually its roots just hand down (about 1m) and watering is by daily spraying of the roots. This was my favourite orchid at the Malvern show. I love the colour. People were amazed by its beauty, unusual patterning, colour and size. Unfortunately it is a little too large for my house as it taller than my ceilings! You mention ‘natural diversity’ does it come in different colours?